Well I try to make it interesting for everyone, even if they have never played it or heard of it before- hopefully they can still read along as if its an illustrated story and still contribute any thoughts or ideas. That's the aim anyway. 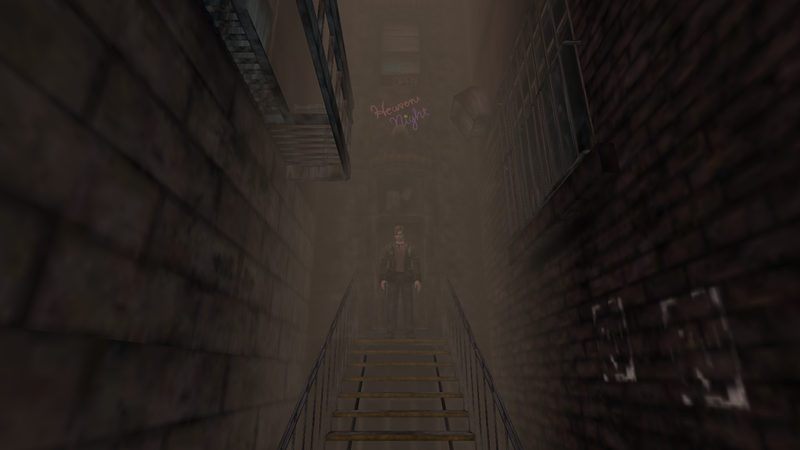 recap- when we left James he had just made his way through the Wood Side Apartment block in an attempt to get to the far side of town and to Rosewater Park, which James hopes will be the 'special place' where Mary his wife is waiting for him, even though she is dead. 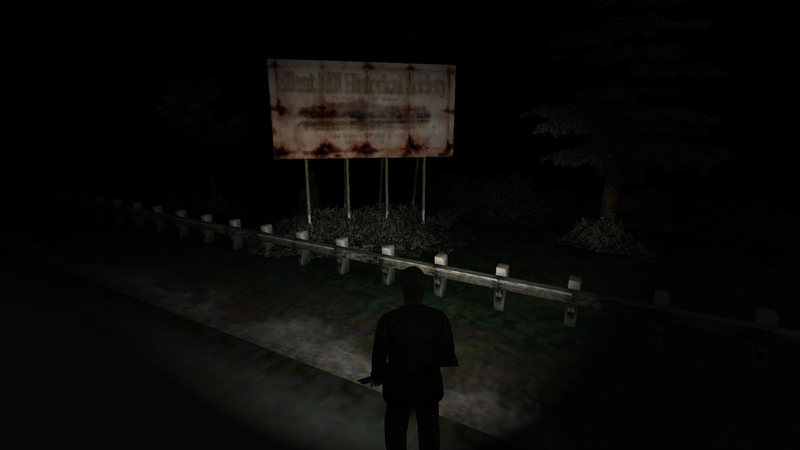 James also met Angela for the second time, the first being in the graveyard, who is still searching for her lost family, and Eddie, throwing up in a toilet, a little bratty girl who stood on his hand, and a Pyramid Headed monstrosity that may be a Demon. 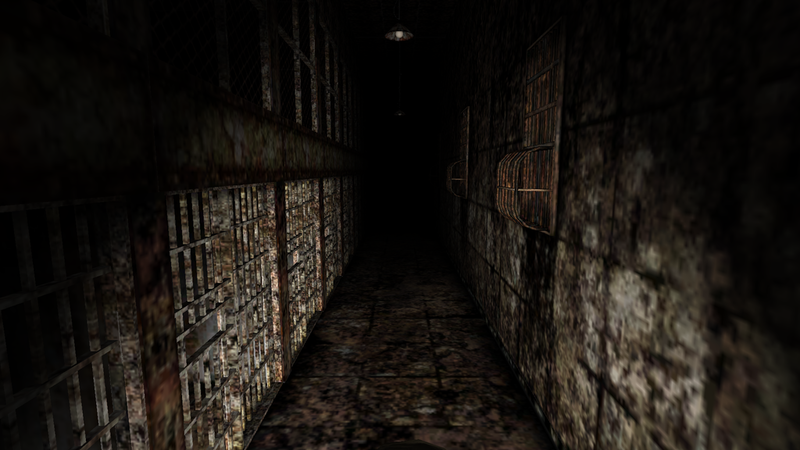 Nevertheless in his bloodymindedness James has managed to escape the apartments and now finds himself ready to go to Rosewater Park and see what awaits him there. Chapter Four- I didn't come here to bowl! So what can we glean here?- well the wall she sits on has drawings of a cat and a bear on it and may have been drawn by the little girl as they seem childish drawings. She knew Mary somehow, and when James questions her on what a little girl is doing here her reply indicates that she thinks that should be self evident. What is the letter she carries with her? Also why does she accuse James of not having loved Mary in the first place? 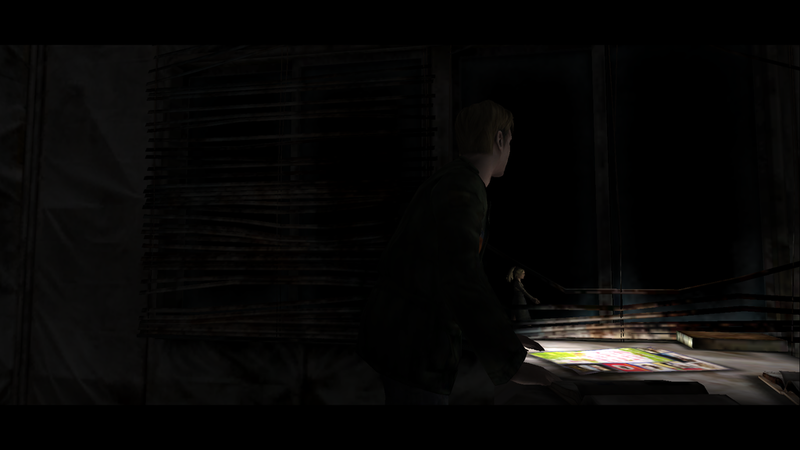 After all he has come to this place and endured rather a lot of horrors so far just to try to find her. So what can you say about Maria? Well the first question to arise is the same as that for all the other characters James meets- is she a real person or a manifestation of the town? She looks and sounds almost exactly like James' late wife, save that she seems to dress differently- more sexual and more provocative. She is a brunette who has bleached her hair blonde and died the tips pink, and she has a butterfly tattoo on her stomach, butterflies symbolising rebirth. She also hints or implies that she knows something about Mary or at least James' relationship with her. She is also just very off, very odd in a hard to define exactly how way. Remember also the posters on the bathroom wall when James set out? 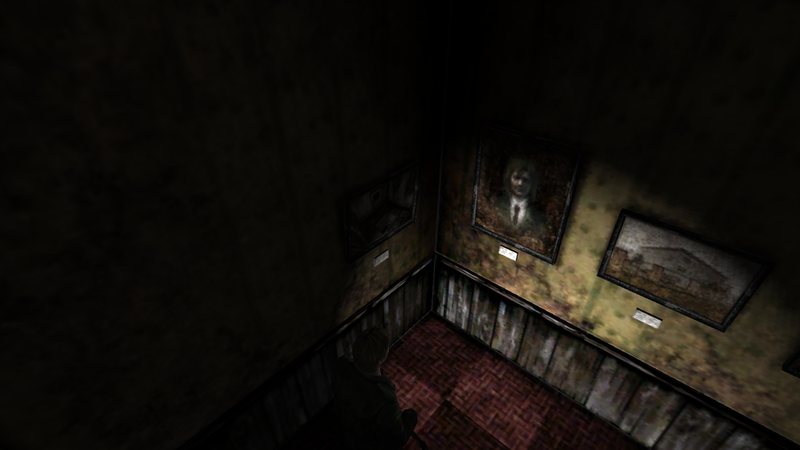 It seems rather than being posters featuring James dead wife, rather they feature Maria. Its also the second time in quick succession someone has called into question James' feelings for Mary, first Laura accused him if not really loving her and now Maria has suggested he really hated her. 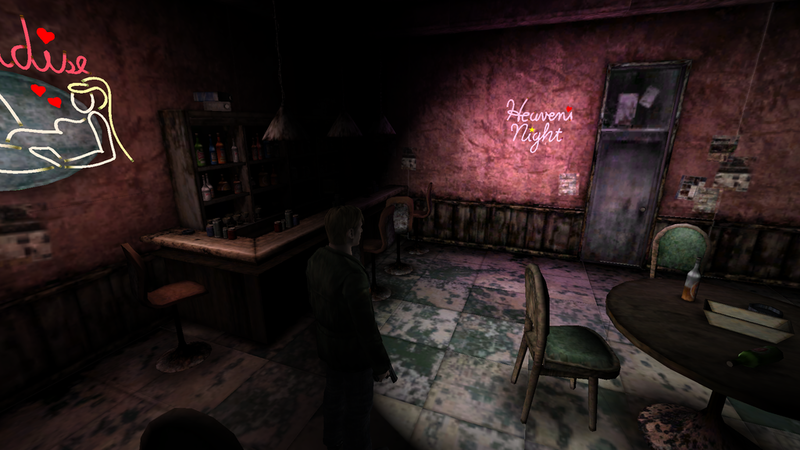 Also whatever the flashback James had it occurred as a result of Maria reminding James of his and Mary's other special place- prompting him to remember the Lakeview Hotel. 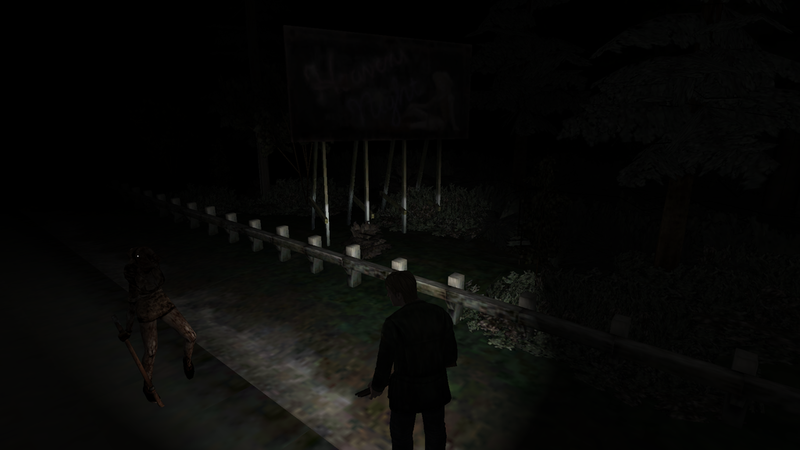 Making the hotel, on the far side of the Lake, James immediate next choice of destination. So it seems Laura already knows Eddie in some fashion. And Eddie had told her he was running from the police, but is now retracting that claiming he really just ran away. But which if any is true? He also shows very little concern for Laura's welfare, seeming to believe she will do fine on her own, as if the monsters and horrors which plague James will not be a danger to Laura. It may also be of note when trying to work out who may be real and who not that Eddie and Laura can clearly see and interact with each other as well as James. And not just any night club but Heavens Night- the nightclub advertised on the posters with Maria's picture on them. Did Maria work here? And given she features so prominently as the face of this club on the posters what was she? A performer? The owner? 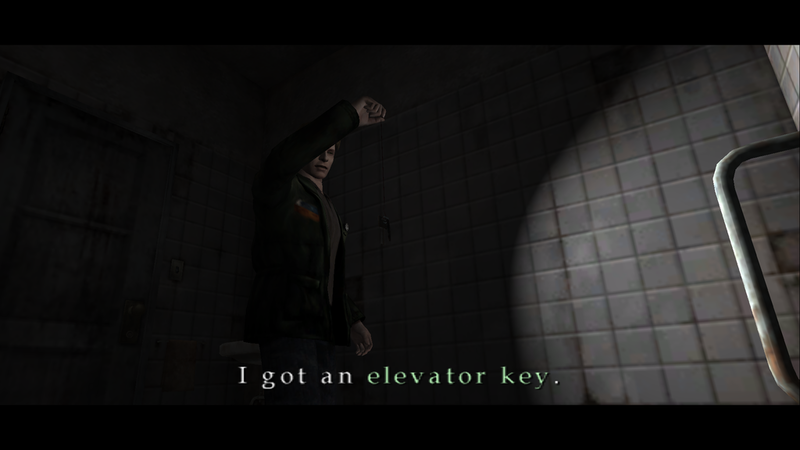 She does have her own keys it seems. Thoughts and speculations welcome- especially on what or who you think Maria might be? Real or manifestation? Coincidence she happens to look like his dead wife or something else? So no one got a single thought or bit of speculation? Anyone even still reading along? Ho hum, ah well you don't get an embarrassingly silly amount of posts by being put off by a lack of response!! 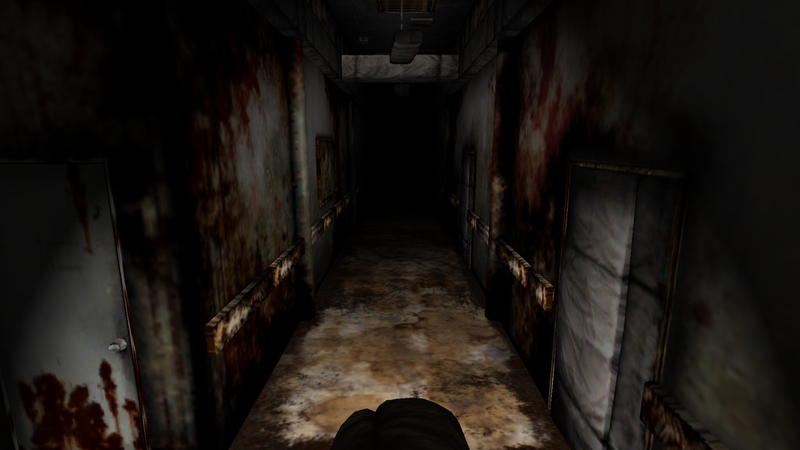 James and his new mysterious companion Maria have entered the not altogether very hygienic looking Brookhaven Hospital in pursuit of a little girl, Laura. The nurses are oddly sexual; they display a lot of cleavage, their skirts are a lot shorter than regulation, they have shapely toned legs but their faces are mutilated and they move in a odd almost clockwork like manner. Like the other monsters James has encountered they are drawn from his own psyche- so what do these nurses tell us about James? Seemingly that he sexualised woman, but did he do so to nurses in particular, or even particular nurses, say the nurses in the hospital where he was visiting his sick and dying wife? Is their violence towards him his own sense of guilt? 'The potential for this illness exists in all people and, under the right circumstances, any man or woman would be driven, like him, to the "other side". Who is the patient- what is the 'other side'? And is James there? 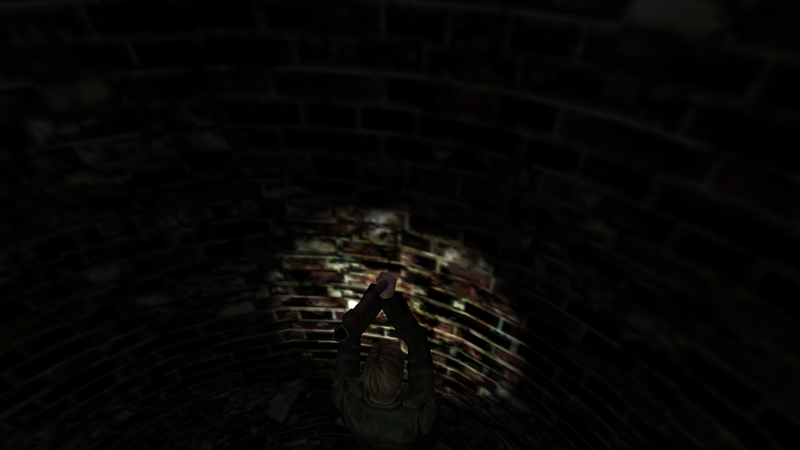 Whatever the puzzle of the notes his search for Laura proves fruitless and finally he finds himself making his way up to the roof to check there for her. Stared out the window all day. Peaceful here- nothing to do. Still not allowed to go outside. Talked with the doctor a little. Would they have saved me if I didn't have a family to feed? I know I'm pathetic, weak. Not everyone can be strong. The meds made me feel sick today. If I'm only better when I'm drugged, then who am I anyway? I don't want to cause any more trouble for anyone, but I'm a bother either way. Can it really be such a sin to run instead instead of fight? Some people may say so, but they don't have to live in my shoes. It may be selfish but it's what I want. The doctors told me I've been released- That I've got to go home. 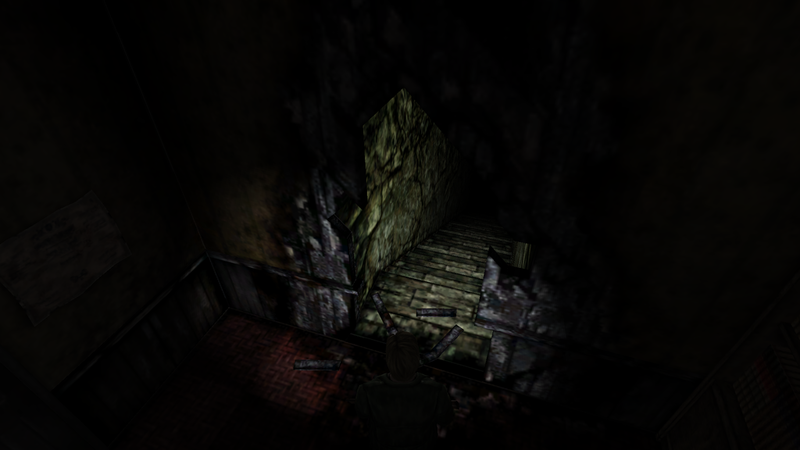 Its worth noting that three times so far James has encountered this creature the first time it retreated, the second time it attacked James, but in such a cumbersome manner it was no threat before again retreating and in doing so allowing James to progress, and this third time despite having James at its mercy it choose instead to knock him off the roof- hurting him yes, but not fatally, and once more James finds himself progressing. 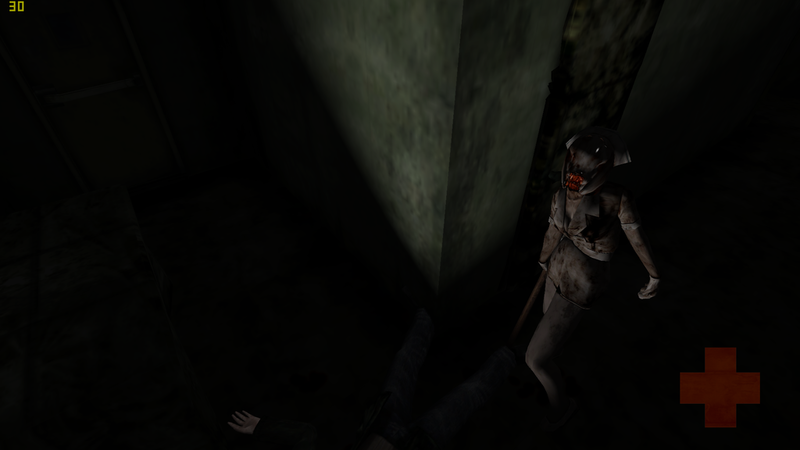 But eventually he is grabbed by the rotting decaying feet of one of the horrors and is choked until he passes out. 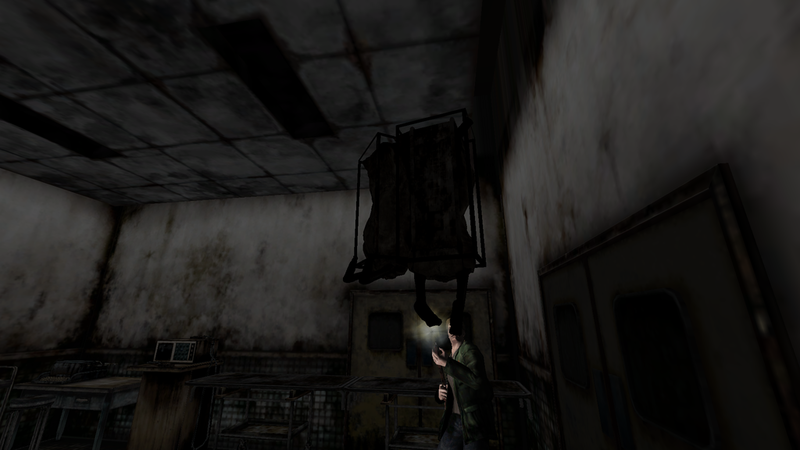 When he comes too he finds he is starring straight up as the ceiling goes past, as if he were being pushed along on a hospital trolley. 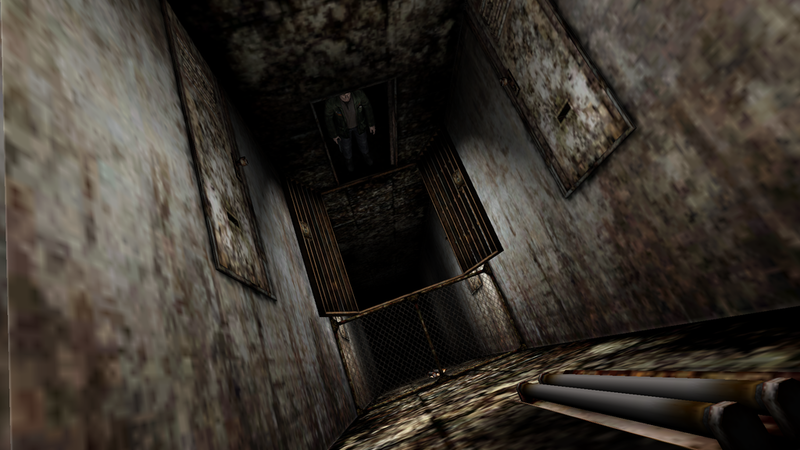 A siren, like an air raid siren sounds as he goes rattling along. 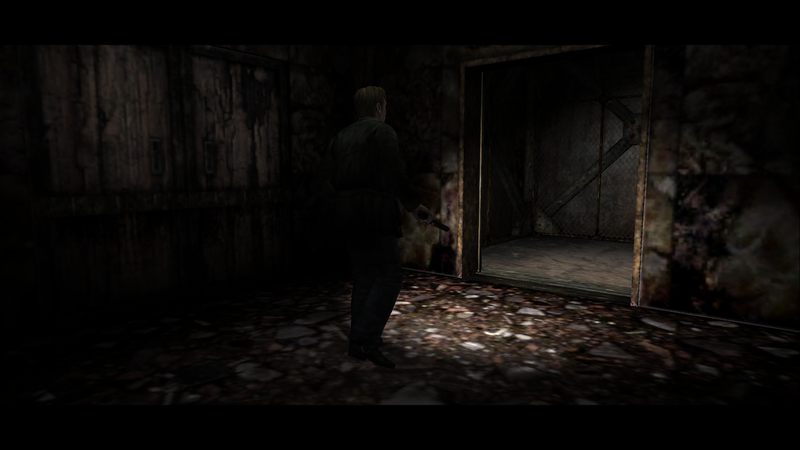 Finally the siren fades and James finds himself in a room with only one door. So what can we discern about Laura from this encounter? Did she deliberately put James in a room full of monstrosities, or was she just getting back at him by playing a prank on him for shouting at her? 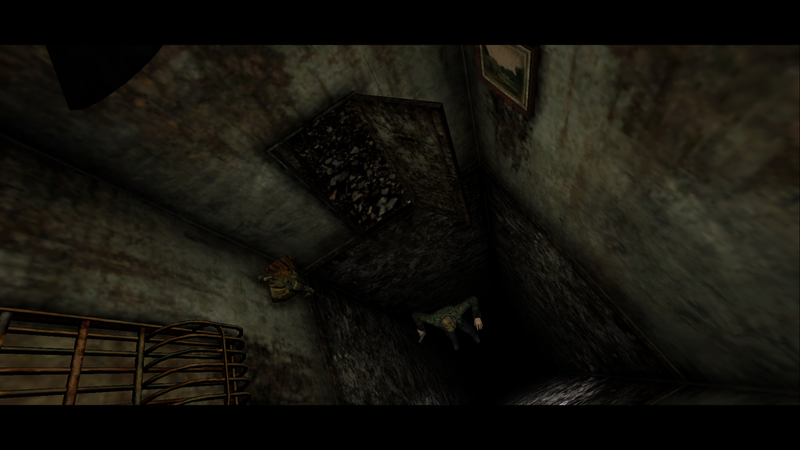 When we first see her she is playing quite happily, as if the corridors are not filled with walking horrors. And when James is amazed she does not have even a scratch her reply seems to indicate that she is not seeing the same monsters James is seeing, or any at all. Is this because as a child she is innocent? But is she real anyway or just a manifestation of the town drawn from James. And how could she have known Mary one year earlier if Mary died three years ago? Is one or other of them wrong about when she died? Or even lying about it? 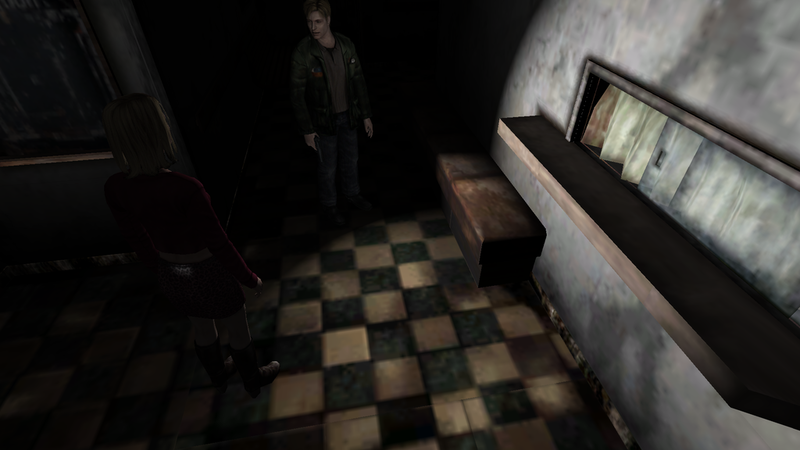 Returning to the room which should be the room Maria lay down to rest in he finds it empty, but by the bedside are medicine bottles. Does this mean Maria is also ill, as James wife Mary was? 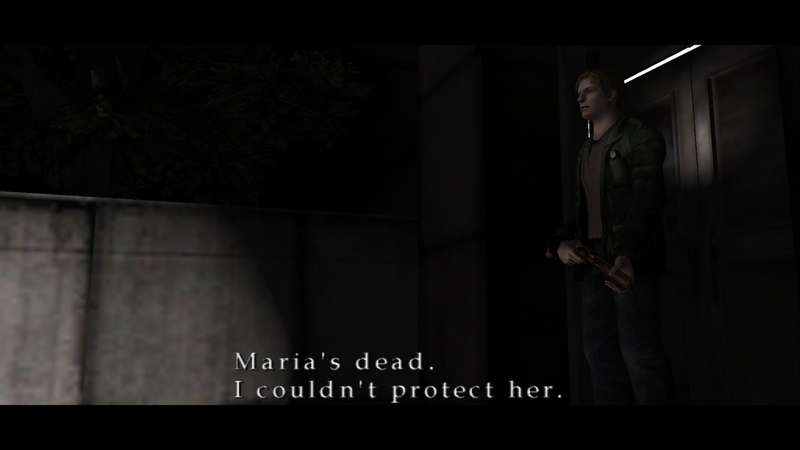 Why is Maria seemingly drawn to protecting Laura? And why doesn't she mention that since she went to sleep the hospital has entirely changed its appearance? More mystery, who is the praying woman? What mooseum? 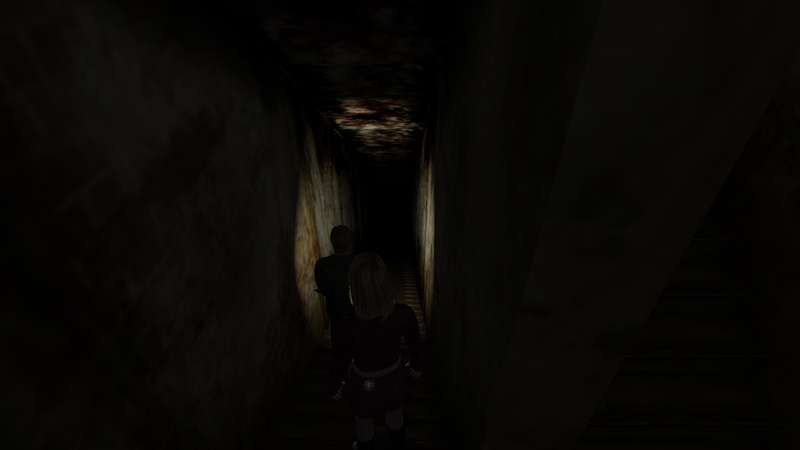 The bottom of which leads to a winding passage, but they have not gone far down it when the Pyramid Headed creature comes up behind them giving chase. It is no longer carrying the Great Knife, but instead is armed with a spear and is much quicker and more mobile for it. 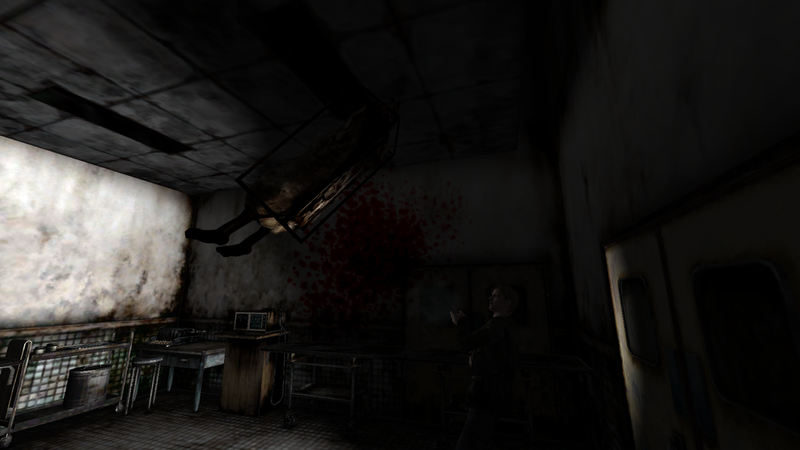 Pulling himself together after the death of Maria James finds that he is back once more in the lobby of the hospital. 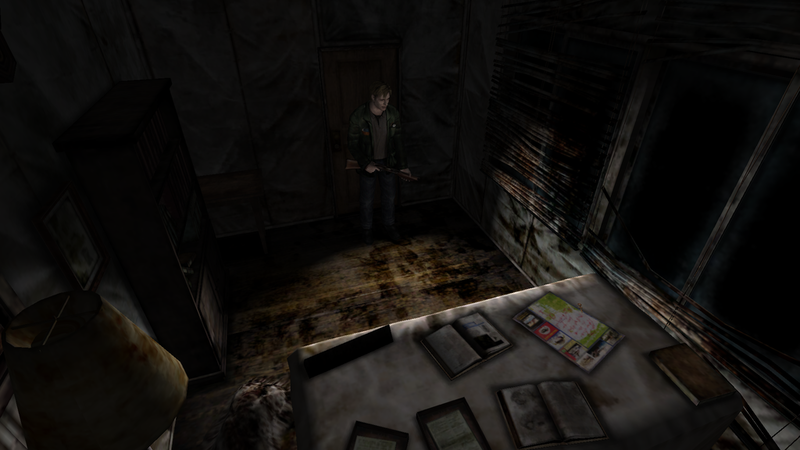 A door to an office is open and he goes in to find a map of the town lying on a table by a window. 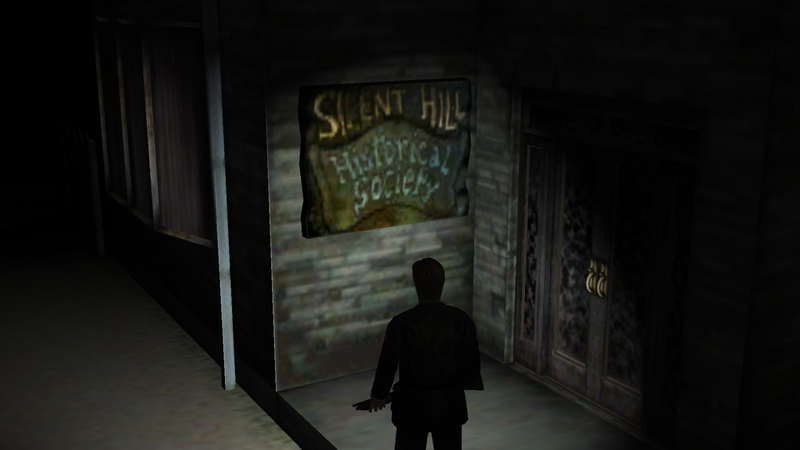 and the Silent Hill Historical Society. Could this have anything to do with the message about the praying woman and the 'Mooseum'? 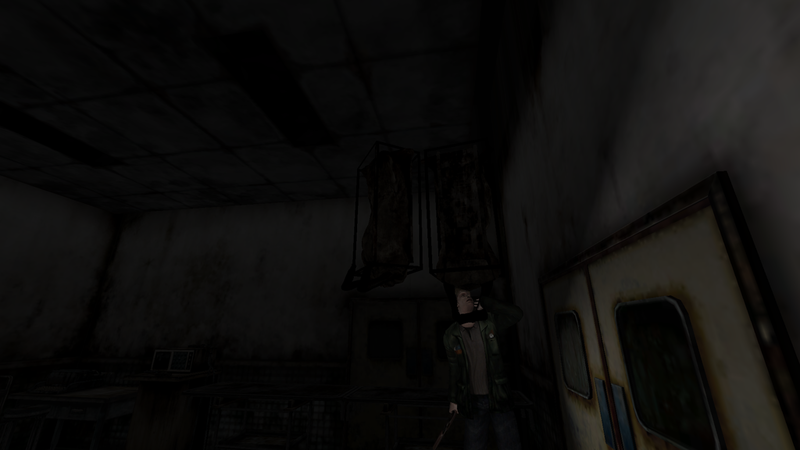 James calls after her but Laura either does not hear him or ignores him. James never completes that final thought, but what was it, what did he think Mary was taking? And what prompted him to begin that thought now, the death of Maria? Is it reminding James of something to do with Mary in her final days? 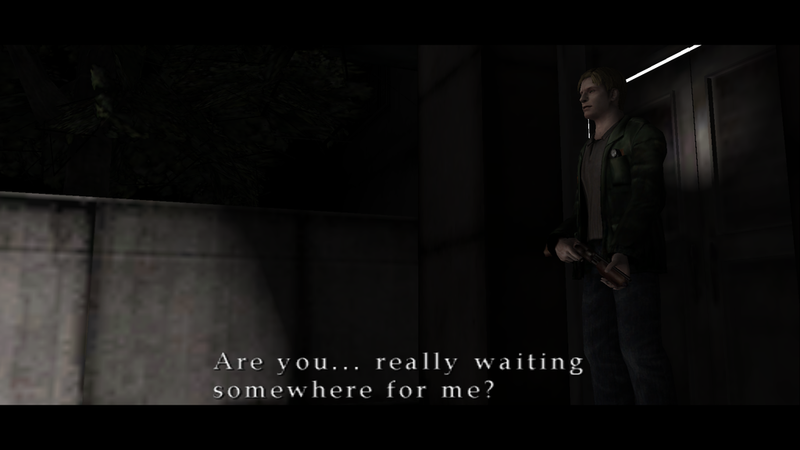 But now the fog is gone, Silent Hill has changed its character, now the world is one of impenetrable darkness through which James must continue on in his search for Mary and their 'special place'. The pseudo-Freudian psychology of it all is quite obvious when presented in this way, I feel. Funnily enough, it's reminding me quite a lot of the film Shutter Island. Have you seen that Petty? Glad someone is still hanging in there and reading along- thanks Forest! I haven't seen Shutter Island, but I just went and read a spoiler free synopsis and I do like the sund of it- sounds like my sort of film- I will have to ive it a go. 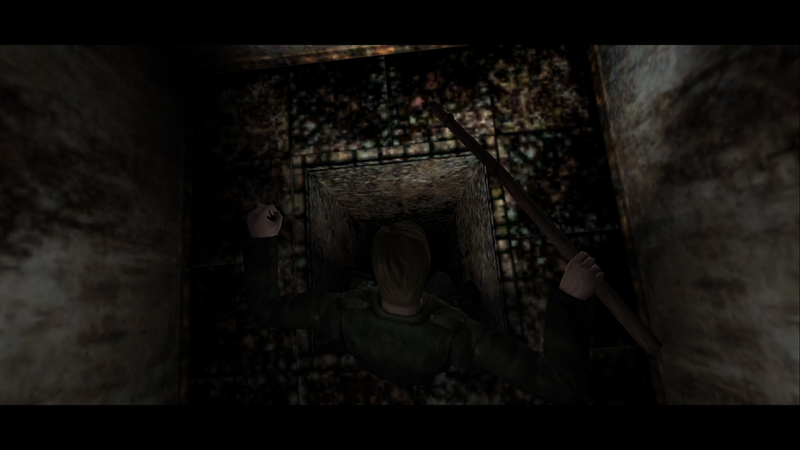 Jacobs Ladder is a big influence on SH2. Its great too if you haven't seen it, but not a comfortable watch. Avoid spoilers though, its plot relies on twists and you have them spoiled it will ruin the whole thing. Hah! You thought I'd forgotten about this (or wished I had) but no we are getting to the meat of the matter so on we shall plod! 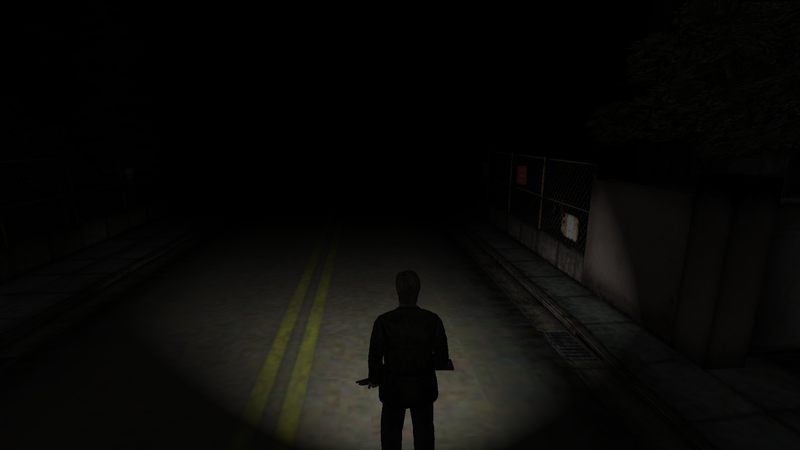 Quick recap of the last chapter- in pursuit of the little girl Laura who claims to have known Mary in hospital, James and Maria enter Brookhaven Hospital. 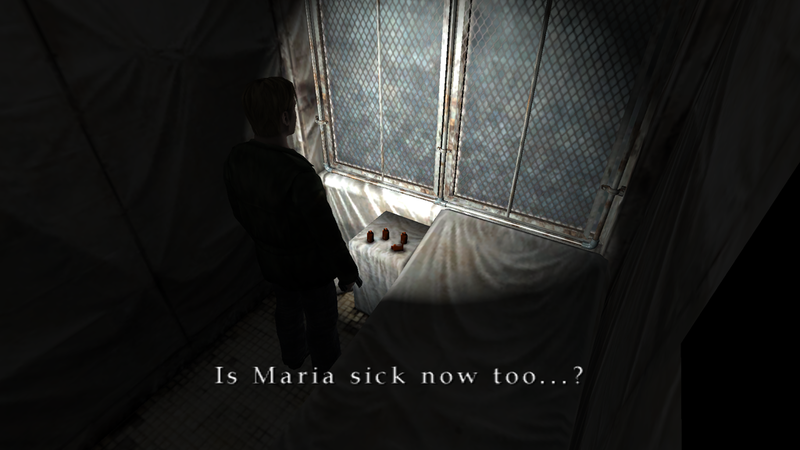 Maria seems to become ill, similar to James' dead wife Mary. 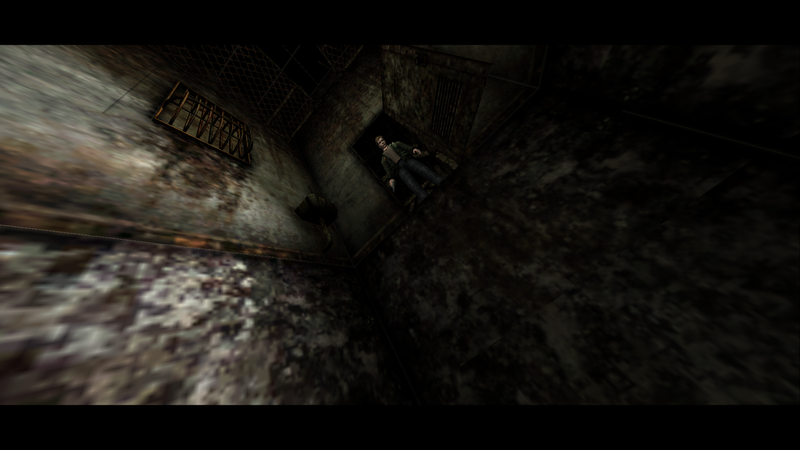 And Laura tricks James by locking him in a room with monstrosities whilst she runs off. 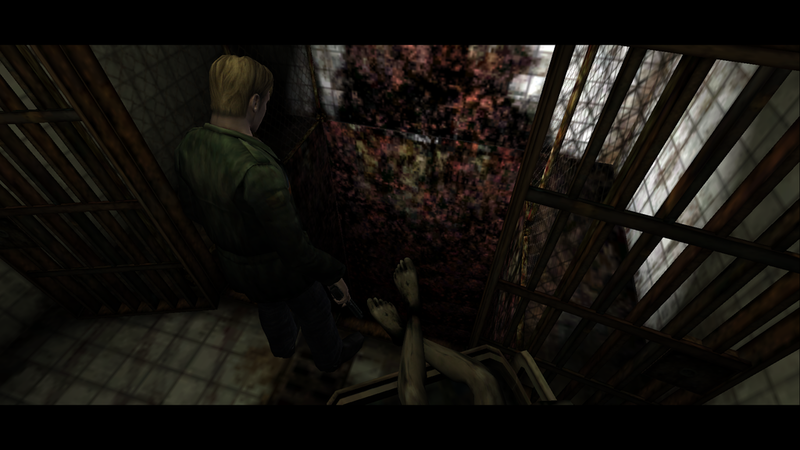 James discovers that a mental patient in the hospital has hidden something in the Silent Hill Park and that a Director of the hospital, a Doctor of some sort was conducting experiments into altered states. 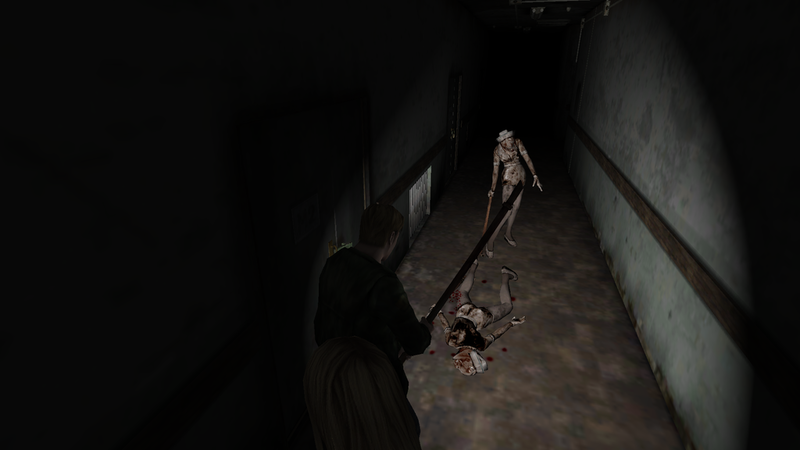 James, reunited with Maria, then continues to try to find Laura but instead encounters the Pyramid Headed Demon once more, this time armed with a spear, which it uses to skewer and kill Maria as James escapes the hospital. 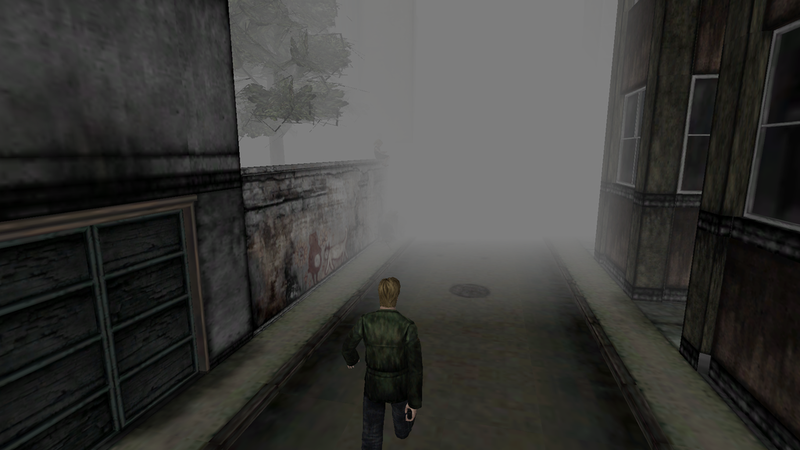 Emerging from the hospital James finds that the town is no longer shrouded in fog but is instead utterly dark. "If yOu waNt to sEE Mary you should just DIE. 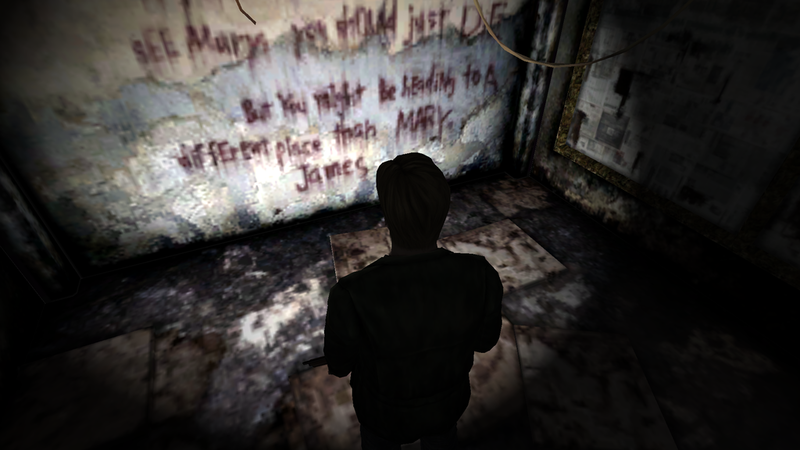 But you might be hEading to A diffErEnt place than MARY, James." 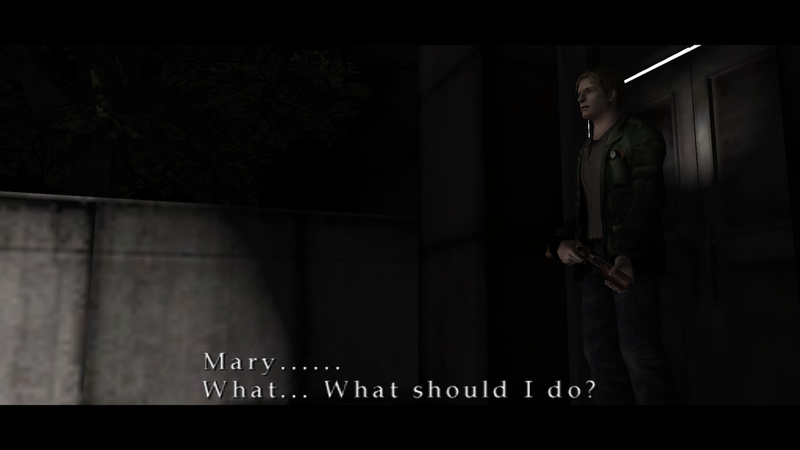 Is the only way to see Mary to die because she is dead? And why would James be going to a different place if that is the case? 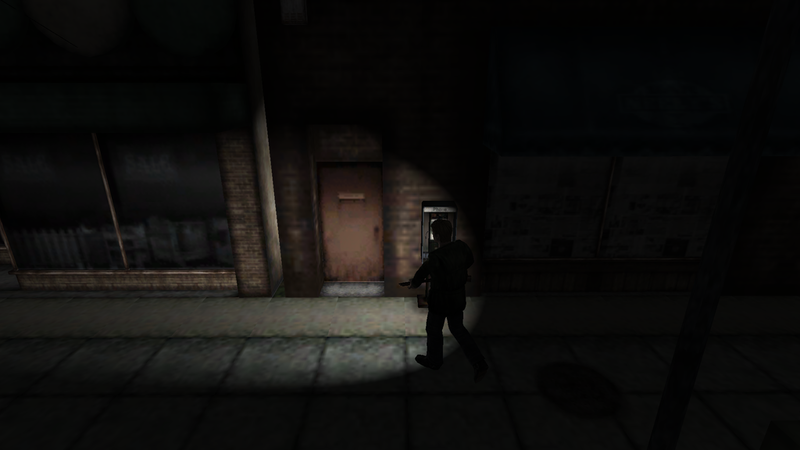 Not much heartened by all this James leaves the bar and continues to follow the map. "Or perhaps you are a fool. The truth usually betrays people. 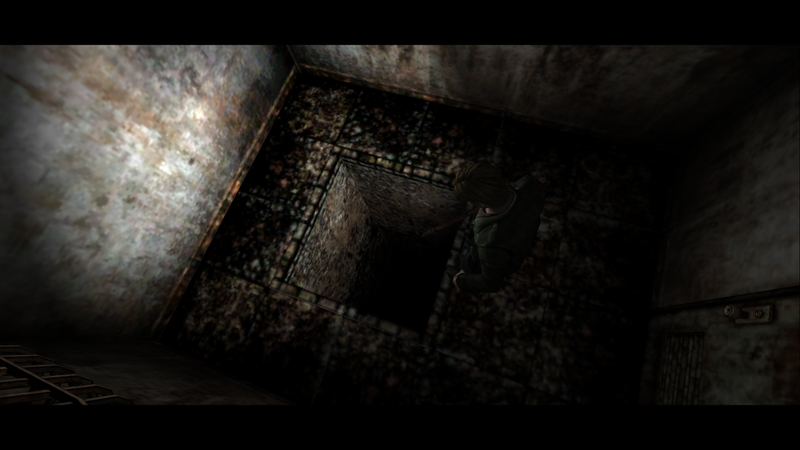 A part of that abyss is in the old society. The key to the society is in the park. At the foot of the praying woman, inside of the ground, inside of a box. My patient buried it there. I knew, but did nothing. It made me uneasy to have such a thing near. I wasn't looking for the truth, I was looking for tranquility. I also saw that thing. I fled, but the museum was sealed as well. 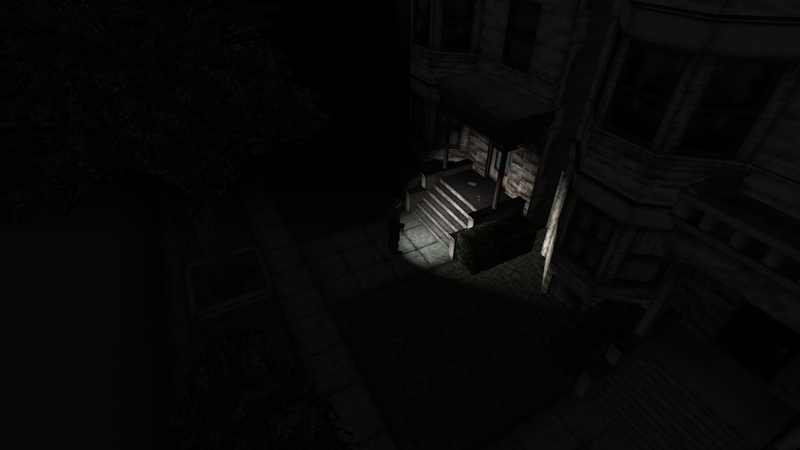 Now no one dares to approach that place. If you do not wish to stop, James, I pray to the Lord to have mercy on your eternal soul." Now there is a lot to ponder here. 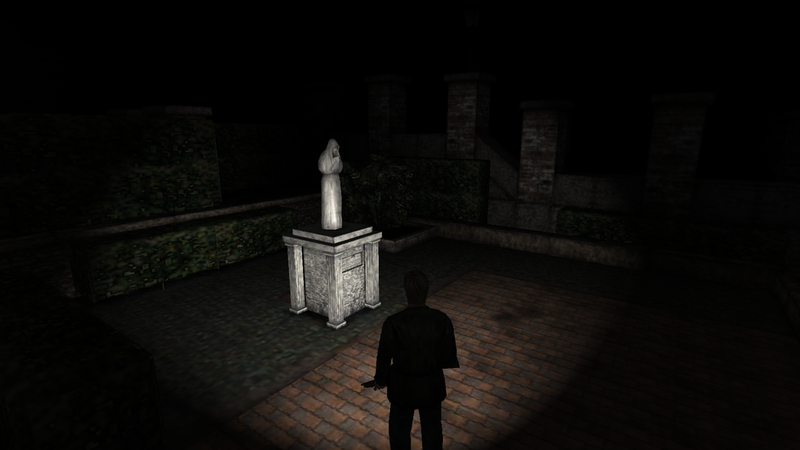 First James now knows where in the Park to look, under the statue of the praying woman. But what is the abyss, and what does it mean that the Society is a part of it? 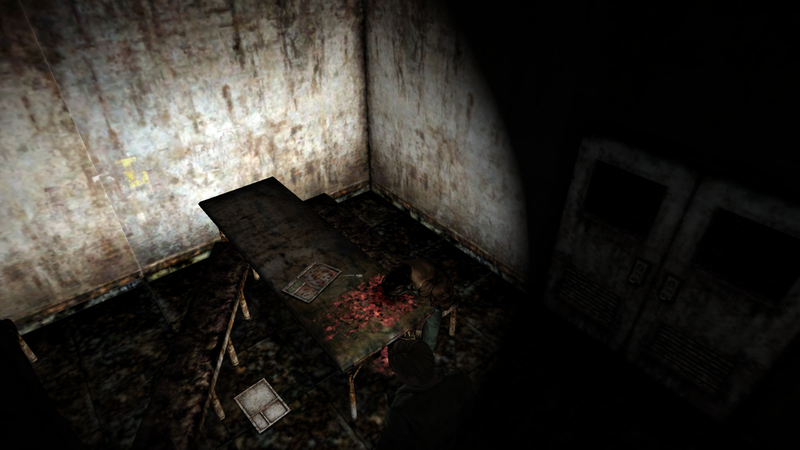 Why does whatever is buried make the Doctor uneasy? And what does he mean that he was not looking for the truth? The truth about the Society? 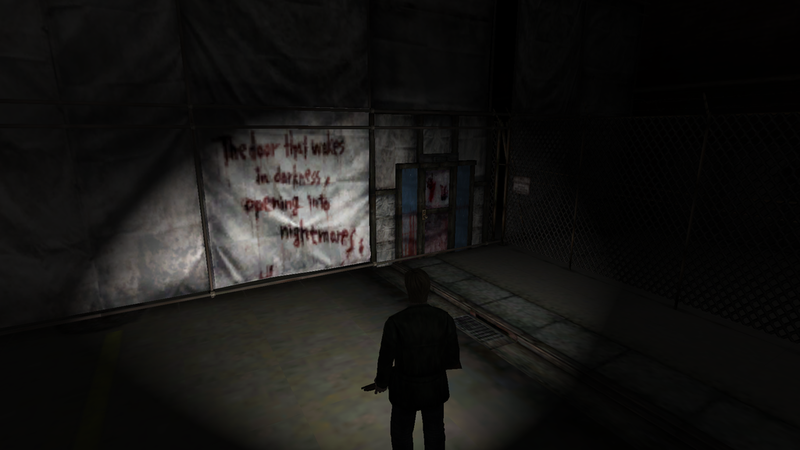 And was his experiments on his patient what he believed would lead him to tranquilty, and instead led him to this Silent Hill? What was the thing he saw? The Pyramid Headed Demon? Why is the museum sealed? Is it the Society referred to? 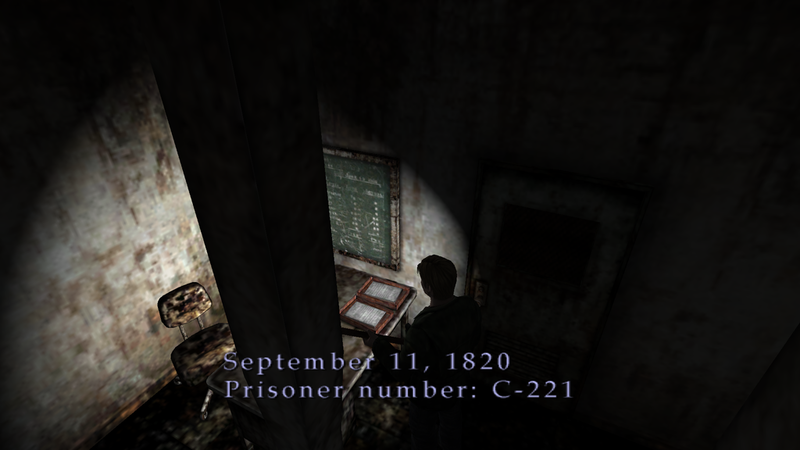 And finally and most inexplicably, why is the letter seemingly written to James? And if James does have the ability to 'stop' he shows no signs of it as he gathers up the letter and sets off again for the Park and the statue. 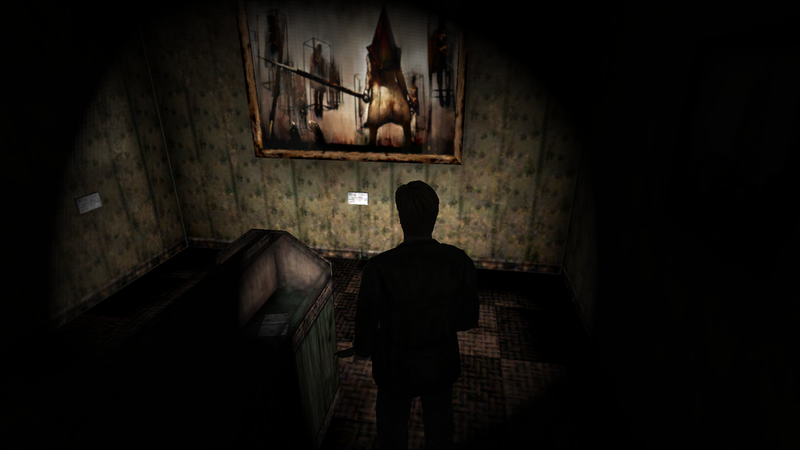 The statue is of Jennifer Carroll, who was one of the founding members of the Order, a religious cult that flourished in Silent Hill and were responsible for the activities in the first game. Jennifer was accused of witchcraft in the 17th century and burnt at the stake. "Victim of persecution by the Christians. Jennifer Carroll lived with pride and honor. What happened here shall never be forgotten." 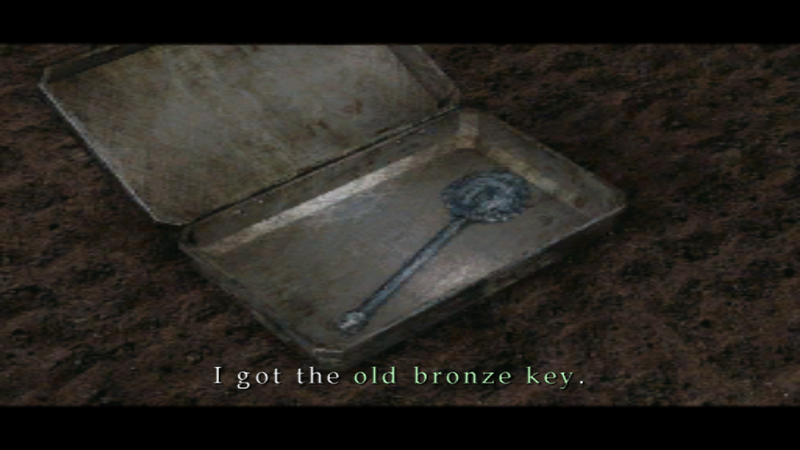 Puzzled as to why this key would bring so much concen to the Doctor James decides to set aside the mysterious and continue his search for Mary. 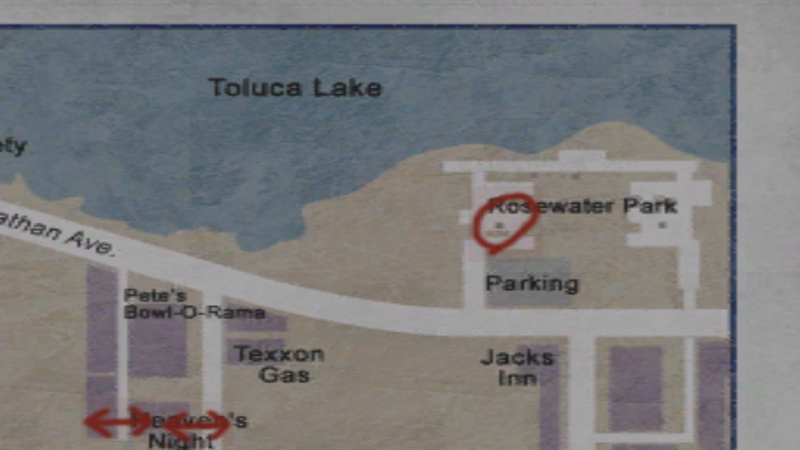 Which means going to the one 'special place' he has not yet been too- the Lakeview Hotel on the far side of the Lake. 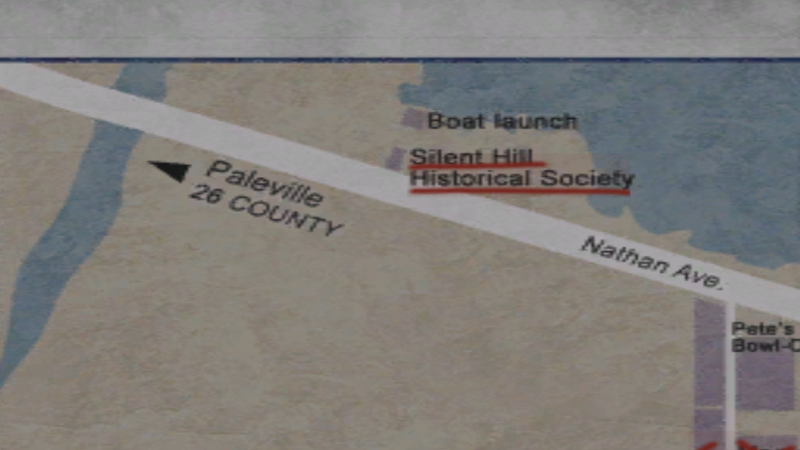 "The Silent Hill Historical Society"
Consulting his map James notes that not only is the Museum close, but beyond it on the shore side is a pier and boat launch which will take him across the Lake to the hotel, and hopefully to Mary. The painting is labelled- 'Misty Day. Remains of the judgement." 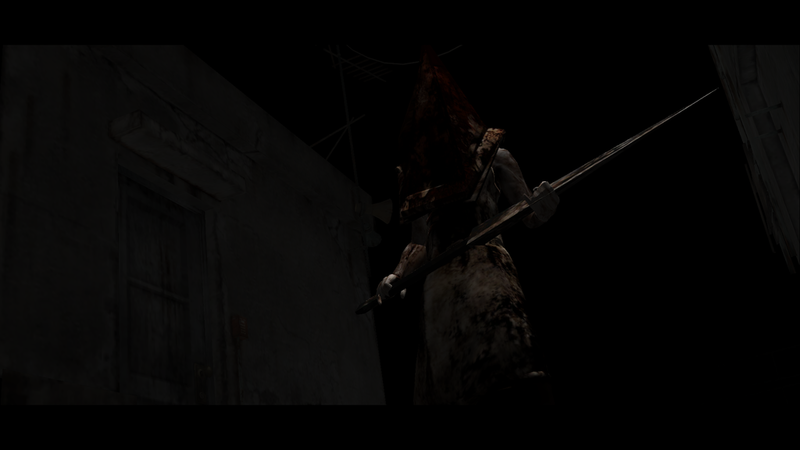 Are the Pyramid Head figures associated with judgement then? 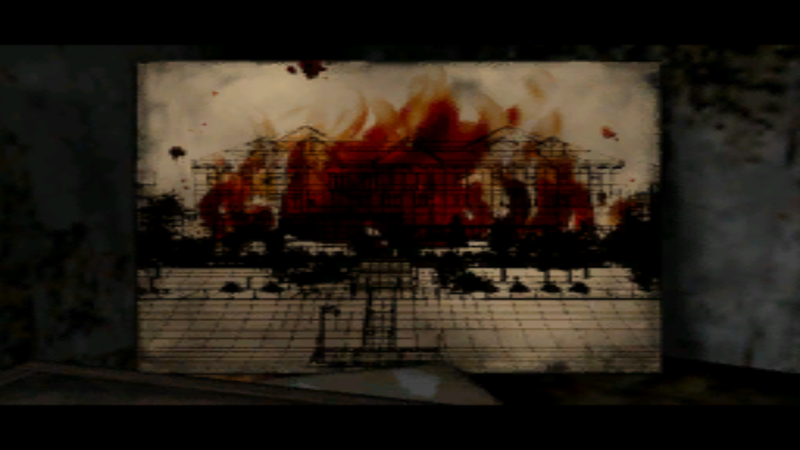 I the misty day a reference to the fog that covered the town before? 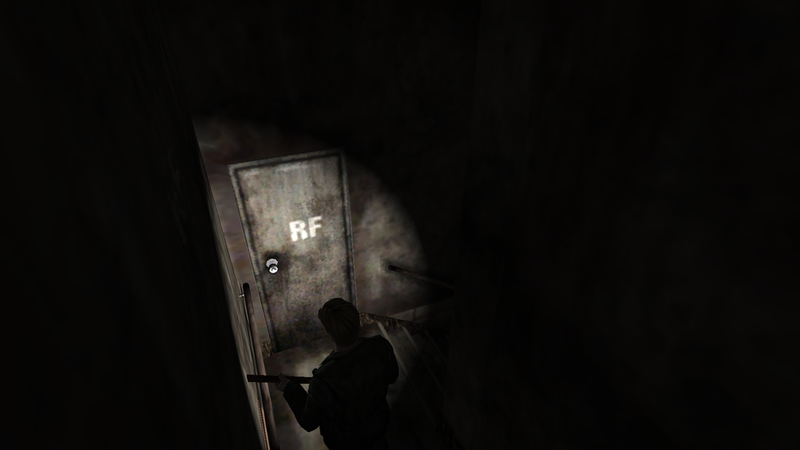 Is this the same Director who left the letter, whose patient stole the key to this place? The label beneath the hospital painting reveals that it was built to deal with a plague which followed a large influx of immigrants to the area. 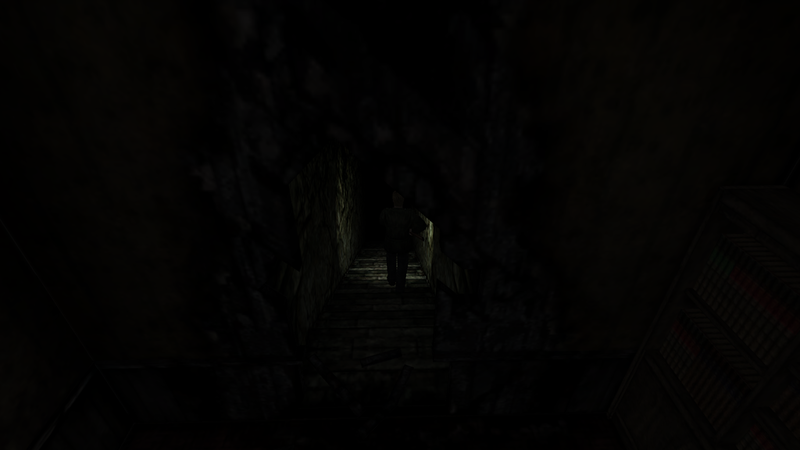 Continuing on further into the museum James comes across a wall which has been knocked through to reveal a stone lined passage beyond. The passage goes steeply downwards, and judging for size of the museum and the map James carries it must go down under the Lake itself. 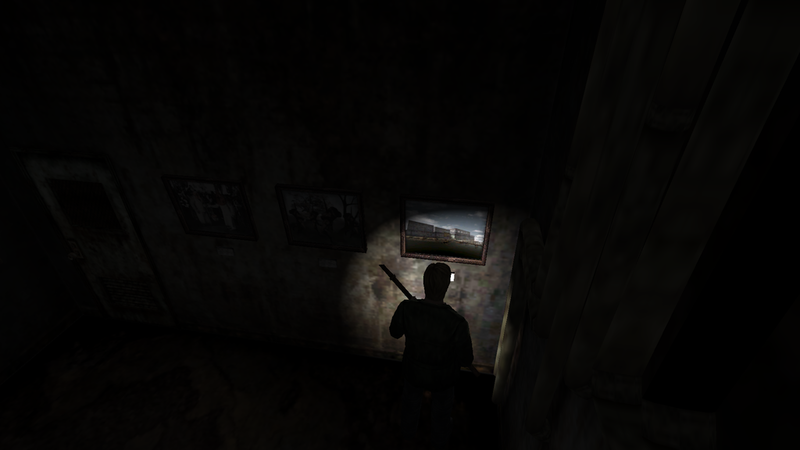 A further examination of the nearby offices turns up some more paintings on the walls. They are tagged as the ones in the Museum above were implying that this prison is part of the Museum now. 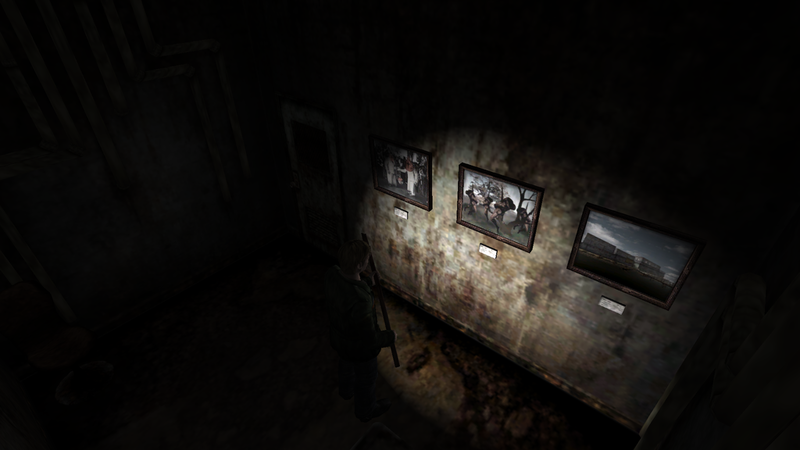 One rather gruesome image catches James' eye, it appears to show a circle of figures, their faces melted and distorted like the creatures which roam the town, but with their bodies skewered through under the chin. 'Death by Skewering- An Execution at the prison. 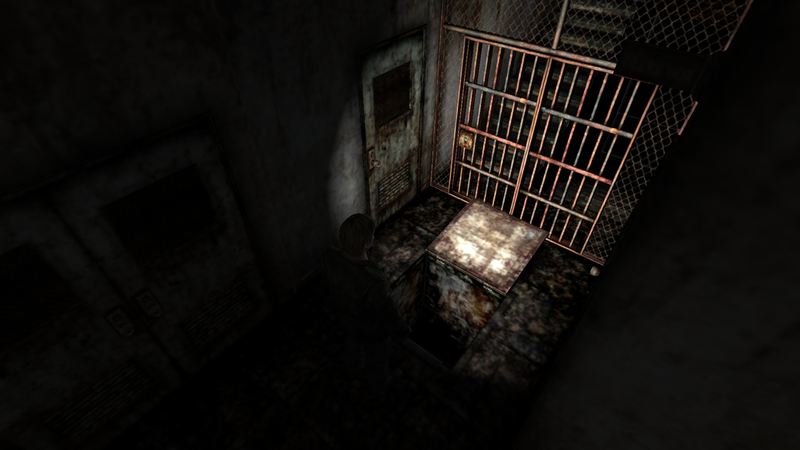 When he comes too he appears to be in a large room, the prison cafeteria area. 'Toluca Lake, the town's main tourist attraction. This clear, beautiful lake has another side as well. It may seem like just a typical ghost story that you might find in any number of old towns across the country. But in this case, the legend is true. On a fog-bound November day in 1918, the Little Baroness, a ship filled with tourists, failed to return to port. Despite an extensive police search not a single fragment of the ship or any of the 14 bodies of passengers or crew has ever been recovered to this day. In 1939, an even stranger incident occurred...."
"Many corpses rest at the bottom of this lake. Their bony hands reach up towards the boats that pass overhead. Perhaps they reach for their comrades." 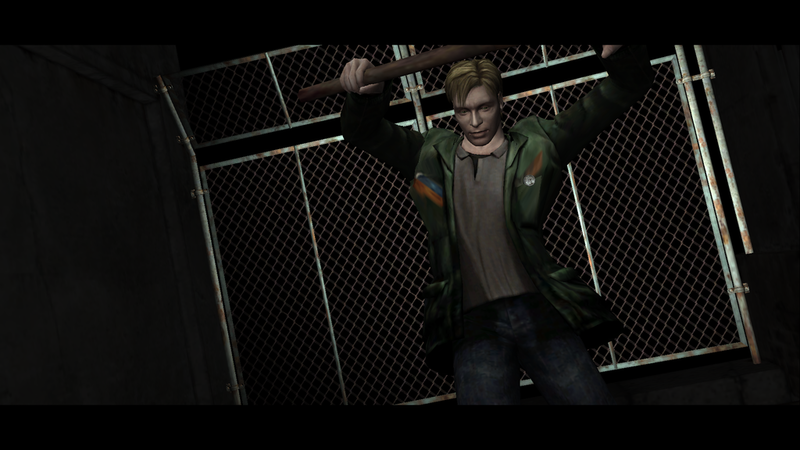 Its worth noting that the first time James met Eddie there was likewise a suspicious dead body but Eddie denied any knowledge of it, this time he is claiming the kill. This is an interesting section. If James ever was in the physical world he would appear to leave it in his Alice like descent under the Lake through a variety of holes. Its clear the depth of the leaps should at the very least have badly injured him, yet after each leap he remains intact. 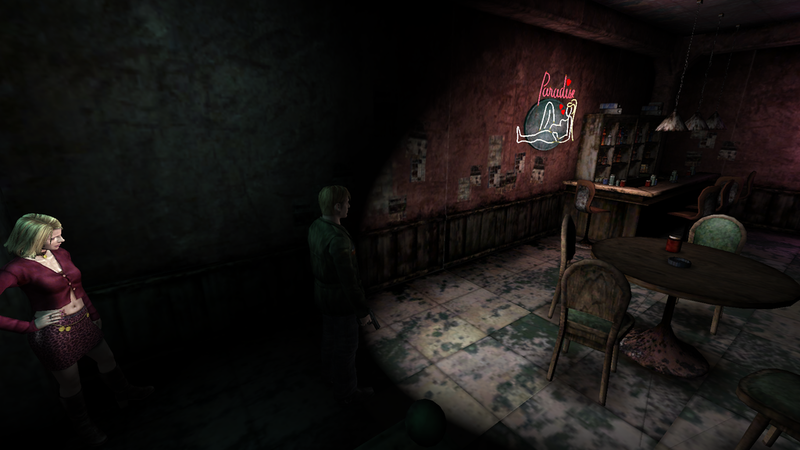 Remember also the message in the window of Neely's Bar- "There was a hole here once, its gone now." 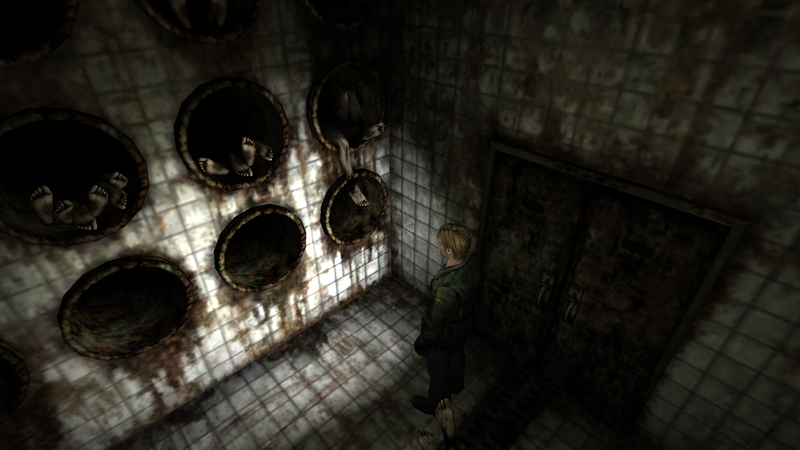 Are these the sort of holes it meant, and where do they take you? We are also delving duther into James and its worth lookng again at what we know about James from what the town has reflected back about him. We know he came here to find his dead wife, but is often accused by those he meets of either not loving her or of hating her. And two fo those he meets, Maria through her looks, words and actions, Laura through an alleged letter she has form Mary, hint at knowing more about Mary than James understands, or at the least is willing to consciously admit to himself. The towns monsters are sexualised, but faceless. 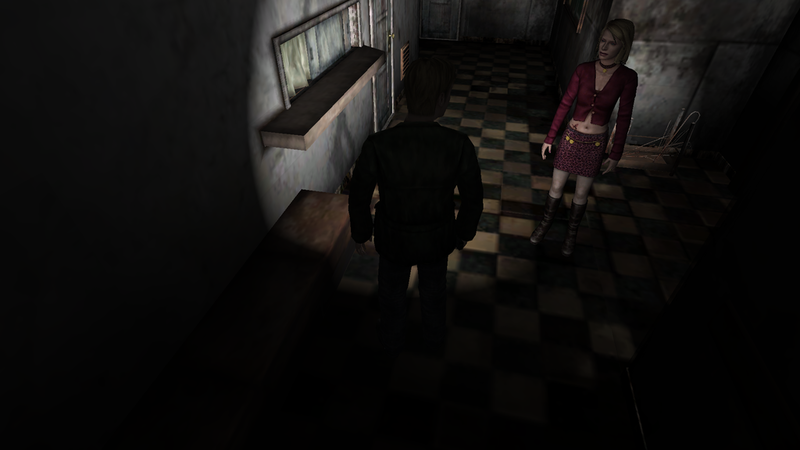 The first main location- the apartments are domestic, right down to a room seemingly mimicking James and Mary's home, complete with her dress on a mannequin and a dead 'James' slumped in front of the TV. The hospital itself served via Mary as a reminder of Mary's illness as well as James sexual frustrations which resulted in his sexualising the nurses caring for his wife. 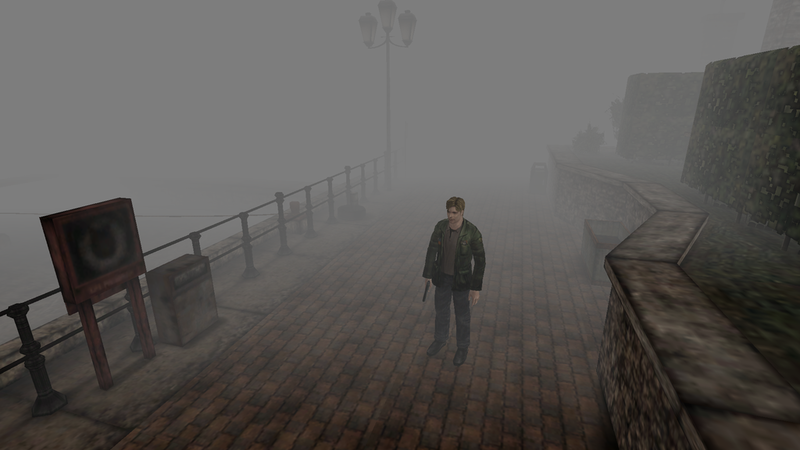 The town itself began as a fog enshrouded mysterious haunted place, then after James was tricked by Laura in the hospital, the town lost its fog and became a place of darkness and metal and rust. 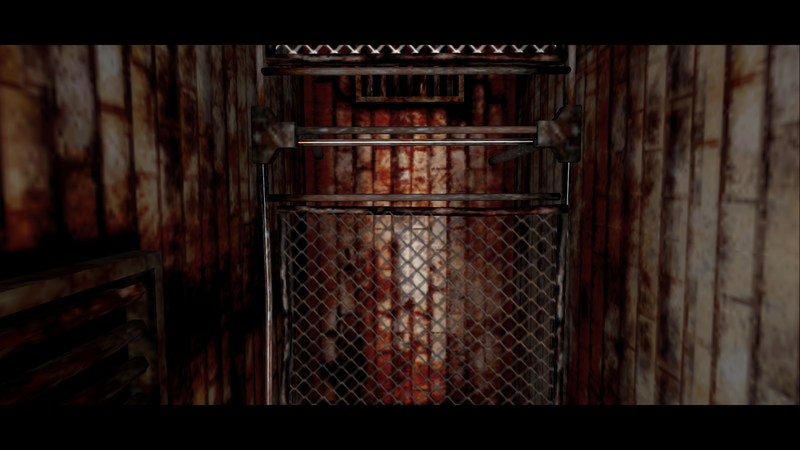 A place of decay, just as Mary's body was decaying in the hospital. 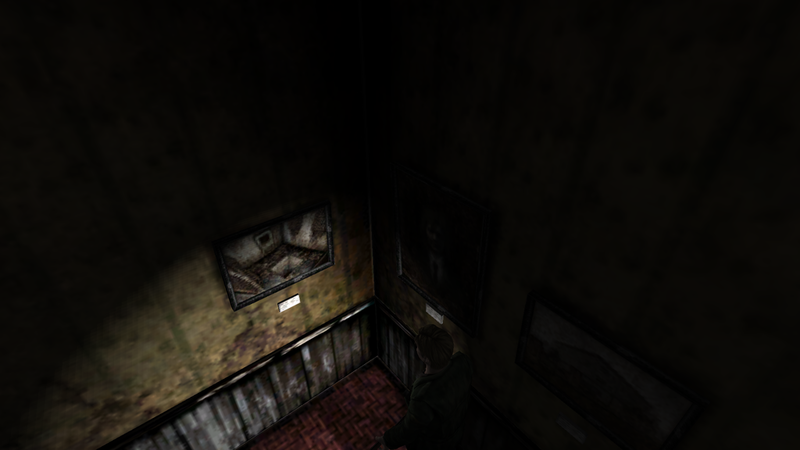 The Museum/Prison on the other hand has a focus on punishment and retribution indicated by the painting of the 'Judgement' featuring a Pyramid Head Demon in the Museum entrance lobby. 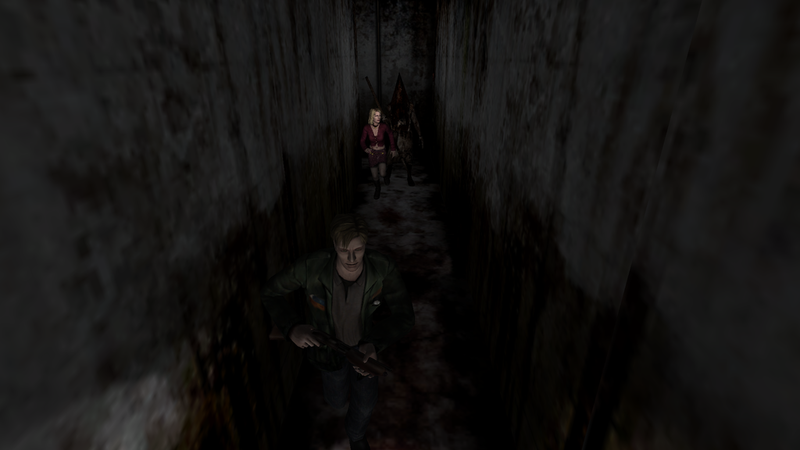 James passage and descent through Silent Hill bears some similarities to Dantes progression through the circles of hell. 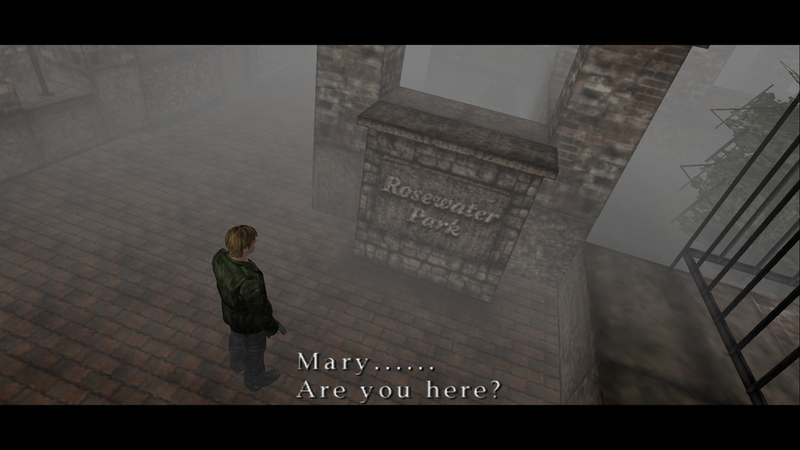 Confronting hard truths in the fog version- accusations about his true feelings towards his wife- then into the Dark World in the hospital with Maria death and acceptance of his own part in it and failure to prevent it or Mary's death, and now punishment.